The keyword in this definition is possibly containing, meaning many of the crypts around the world have mummified bodies completely uncovered and in pieces. Hanging on walls. Framing an altar. In some cases, the bones were used for a bannister or staircase. Is this a new form of design? Not exactly. I believe the bones, and you can tell me if you agree with this, represent the afterlife. They have been left behind, as they served their purpose. Why Crypts Were Used as Opposed to Cemeteries? In a practical sense, crypts were used much like cemeteries. To bury the dead. Associations with vampires over the years, however, have cause mixed opinions. This is, of course, because of mainstream media and the Hollywood horror genre in movies and television. To combat the issue of cemetery crowding, crypts were used. To stop looters or vandals from stealing precious artifacts. To protect the dead from the harsh environment. To preserve a person of significant importance. To furnish an altar only accessible to certain people. To evoke fear and the possibility of evil, crypts were used. Personally, I’m a bit fearful of small spaces. Crypts represent the discomfort people feel in the presence of the dead and in small spaces. This proves to you and me, whether we believe spirits are present in these crypts, our human connection with this idea makes us uncomfortable. It’s this idea keeping people away from the crypts. The spirits. The dead. An atmosphere built on a person’s greatest fear. Where Can Crypts Be Found? Catacombs- are ancient, human-made subterranean passageways for burial or protection. The word “catacomb” is most commonly associated with the Roman Empire. Tombs- a storehouse for the remains of the dead. It’s generally any structurally enclosed interment space or burial chamber, of varying sizes. The word is used in a broad sense to encompass a number of such types of places including: sarcophagi, vaults, rock cut tombs, crypts, monuments, sepulchres. Ossuary-a chest, building, well, or site made to serve as the final resting place of human skeletal remains. They are frequently used where burial space is scarce. A body is first buried in a temporary grave, then after some years the skeletal remains are removed and placed in an ossuary. The greatly reduced space taken up by an ossuary means it’s possible to store the remains of many more people in a single tomb than if the original coffins were left as is. Mausoleum-are above ground, free standing buildings, often concrete structures holding family members or one person. A tomb can be found inside a mausoleum. You may be familiar with the Catacombs in Paris, which is a series of tunnels, the remnants of France's stone mines, lined with over six million bodies from around the 12th century from the overcrowding of cemeteries during the rise of Christianity. 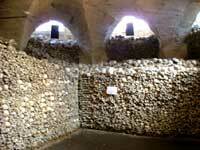 The Catacombs is a form of ossuary, meaning it holds the skeletal remains of humans. The Capuchin Church is a Baroque inspired church built in Bryno in 1604. Capuchin is famed for its crypt, which contained more than 150 friars buried here between 1658 and 1787 during the reign of Emperor Joseph II. Today, there are 24 friars lying on the floor. The friars are fully clothed and their heads rest on bricks. Oddly, their facial expressions remain, as do the religious objects, which have been placed on their chests. The Wola Gułowska , built in 1782, is most famous for its miraculous image of the Virgin Mary, recognised in 1982 by the Archbishop Józef Glemp, and a copy of the image of Madonna. Under the church, a small brick lined crypt was built, which contains a coffin and two skulls. In October 1939, Polish soldiers fought the Nazi invaders in the Wola district of Gułowskiej, culminating in the Battle of Kock near the village. A shrine and Museum was erected in the village after the war to remember the fighting. Crypts represent many facets of life, as well as death. Over the centuries, they’ve been used to combat overcrowding of cemeteries, as well as repository units for royal families, monks, priests, and other significant persons. For you and me, they appear to be small spaces encompassing a part of life we’d like to avoid. For those that reside in the crypts, they may represent completion of a life lived well. With honor. Without malice. A place we should respect. In your opinion, what is the significance of a crypt as opposed to being buried in a cemetery? I believe they invoke a sense of spirit. You?